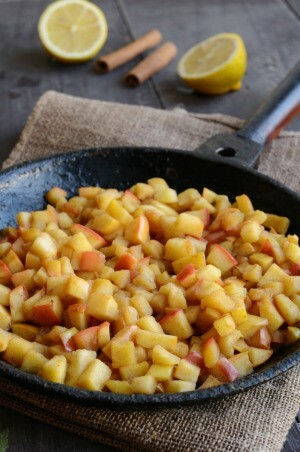 If you are looking for a delicious side dish made with apples, try a saute. This page contains sauteed apples recipes. Sauteed apples are great as a breakfast side or with a meal featuring pork and even as a simple yummy treat but adding the almonds adds a nice extra touch. I happen to like mine plain but feel free to spice with cinnamon and/or nutmeg to taste. Mix the apples, brown sugar, lemon juice and almonds in a medium bowl. Heat butter in a medium skillet; add the apple mixture and sauté on low until they are softened to your liking. Melt butter in a large skillet over medium heat. Add apples and cook, stirring constantly, until apples are almost tender, about 6 minutes. Dissolve cornstarch in water and add to skillet. Stir in the brown sugar and cinnamon and then boil for 2 minutes, stirring occasionally.